Mr. Joseph Mtesia, headmaster at Misiani Primary School greeted us as we walked toward the shade tree where our meeting would be held. “Today, we are keeping the children after school for a while because there are elephants grazing nearby.” I looked around at the smiling faces of the children; they were playing with homemade hula hoops and soccer balls made from old bike inner tubes. Lifewater and World Vision have been partnering for two years on a program to bring safe drinking water sanitation and hygiene education (WASH) to 5,700 students at 10 primary schools in eastern Kenya. Mr. Mtesia introduced us to three parents and two teachers involved in the water sanitation and hygiene in Schools program. He went on to speak excitedly about the improvements he’s seen in the school in the past year, “The WASH in Schools program has given these students confidence in their English speaking abilities and boosted their self-esteem! They are teaching the other students about hand washing and how to use the new latrines.” Enrollment at Misiani School has increased in the past year from 49 to 126 students, in large part from improvements made to the school and the buzz around the community about the water sanitation and hygiene program. “Previously, the children did not wash their hands before eating, and drank water straight from the polluted source. Because we have now learned about WASH, we have begun to change our behavior. The children now have fewer stomach problems; absenteeism is decreasing and the performance of students in increasing. The cases of ringworms have been reduced to almost zero and we are improving the environment by planting very many trees!” His enthusiasm was contagious and the parents who joined us confirmed that many changes were taking place. Lifewater and World Vision constructed and repaired water tanks at 10 schools, and built 108 new latrines for boys, girls, and teachers. But the real stars of the program are the students and teachers who participate in the WASH in Schools program. While school students learned about the 10 Building Blocks, their parents were also learning about safe water, sanitation and hygiene from parents trained by Lifewater in Community Health through Hygiene. Mrs. Benedetta Katumbi works with community members around the Mbetwani Primary school teaching her neighbors about WASH. Benedetta told us, “we have been teaching the women about cleaning the water containers used for fetching water, and the use of soap for hand washing to reduce sickness. We have showed them the SODIS method for treating drinking water, and how to clean their households. 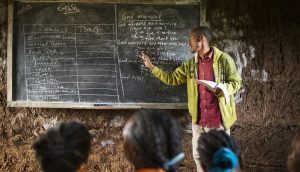 They also know how to build and maintain latrines at home.” In the ten communities surrounding the schools, WASH messages are being taught to parents during the Parents-Day, at church meetings and at the bazaars and markets held locally. Hotels and restaurants are changing their practices and over all, better health and well-being is noticeable. At one school, the entire village of more than 200 people turned up to say thank you and to share how their lives were being changed by this amazing program.